Recently a statement came to this writer’s attention, that warrants addressing. The statement in essence stated that “preachers should leave their education at home and preach what is given them by the Holy Spirit.” Suc h a statement needs more clarification. If by “education” is meant that one who has earned formal degrees and with prideful reliance places them above the Word of God and the Holy Spirit when preaching, then I agree. However, if by “education” is meant that one should not prayerfully study and prepare for the message to be preached and “just rely on the Holy Spirit,” then I strongly disagree. This writer is not defining “education” necessarily by degrees and diplomas (though it could be), but any preacher who consults Bible commentaries or reads books on the Bible in an attempt to better understand the Sacred Volume, then he is “educating” himself. Are not preachers to “educate” themselves in seeking to better grasp the contents of the Bible? Did not Jesus say the Holy Spirit “will bring all things to your remembrance, whatsoever I have said unto you” (John 14:26)? Well, how can the Holy Spirit call to one’s remembrance the Word if it has not been stored in the memory bank? The more we “educate” ourselves in the Word and about the Word, the more the Holy Spirit has to draw from to “call to remembrance” when one does preach. A preacher must continually strive to “educate” himself in regard to the contents of the Bible. No preacher should ever say, “I am just depending on the Holy Spirt” as a reason not to study or a reason to lazily be unprepared. Many years ago there was a public service commercial that stated, “A mind is a terrible thing to waste.” It sure is, and a preacher must continually “educate” his mind with an understanding of the Scriptures so he can effectively communicate it to others. Now by “education” I mean one should avail themselves of the available myriad of tools and resources to better understand the Bible whereby one can better communicate to others, with the help of the Holy Spirit, through preaching and teaching its eternal truths. This “education” need not necessarily be “going off to school” (though it could mean that and if that opportunity avails itself take advantage of it), but it means one should take advantage of every tool available to know the contents of the Scriptures. In the technological day in which we live, where so many excellent biblical resources are available at our finger tips, there is no reason for a pastor to not seriously delve into those resources for the purpose of obtaining a better grasp and understanding of the truths contained within the scared pages. Anytime one engages in the study of the Word, they are educating themselves to be more proficient in the relating of its truths to others. A minister should have an insatiable desire to know what the Bible teaches and how to communicate it better. While I was fortunate and am most thankful I was able to “go off to school,” the majority of what I have learned and know about the Bible has come through personally spending vast amounts of time reading and digging into the Word and taking advantage of all the study tools and resources that are available to “educate” one’s self. It is called, old-fashion hard work. Every minister should have an unquenchable passion to know what the Bible teaches and how to better communicate its truths. The apostle Paul wrote to young Pastor Timothy, “Study to show thyself approved unto God, a workman that needeth not to be ashamed, rightly dividing the word of truth” (2 Timothy 2:15). We must do the same, and that means setting aside the time to pray, diligently dig into the Word in order to mine the golden nuggets contained within its pages. In other words, one must put in some hard work if one wants to understand the Bible better. It is recognized when one is working a full-time job and has a family, time spent in the Word can be hard to come by, but in giving what time one has with relentless diligence, it will be discovered the Lord will multiply the productivity of the time spent educating themselves as to its understanding. While schooling, studying commentaries and study helps should never replace prayerfully reading of the Word, they are essential tools in helping better understand the Word in regard to the historical setting, the customs of the day, the context in which a book or verse was written, and the identity of the people to whom are being addressed or mentioned in the passage being read. It is important a preacher pursue a greater understanding of the Bible and continually be about the business of “educating” himself. That is a lifelong process, as one can never exhaust the truths in the Bible. Examining Paul’s words to Timothy, there are found at least five reasons why the preacher should persistently pursue “educating” himself in a better understanding of the Word. First, it is important because it is a Command of the Word. Paul begins 2 Timothy 2:15 by saying, “Study…” It literally means “continue to give diligence to; to make haste; be earnest, be zealous to do.” The Bible commands us to be diligent about knowing its contents. The command to “study” contradicts the thought that we should just sit back and allow the Spirit to send the message without the proper preparation of hiding the Word in our hearts. We must give the Holy Spirit content to work with! Second, it is important because one’s genuineness is Confirmed by the Word. 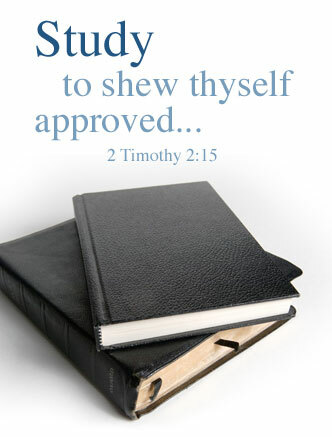 Paul says we should study “to show thyself approved unto God.” The word “approved” refers to being tried and proved as precious metals are proved before they are accepted as genuine. That one studies the Word and has a passion to know what it says is proof of the genuineness of one’s faith and the desire to live an approved life that God is pleased with. Third, it is important because it is through Continuous labor fruit results out of the Word. Paul calls Pastor Timothy a “workman.” The Greek word translated “workman” was used to speak of a laborer, a framer, an agriculture worker. One who works in agriculture realizes that no fruit is forthcoming unless there is consistent labor, unless there is a continual cultivation of the crops. The more one digs in the Word and waters it with the perspiration from one’s brow, the more the Holy Spirit can use it in our personal lives and when ministering to others. It is through consistently plowing through the Word that fruit results from one’s proclaiming the truths contained within. Fourth, it is important because it instills Courage from the Word. Paul states that the preacher in proclamation of the Word “needeth not to be ashamed.” Studying the Word instills within the preacher courage to not be ashamed of its message, which is often contrary to the culture, but to courageously stand for and on the Word. One is not to be timid in the presence of the Word or embarrassed to proclaim its truths. Fifth, it enables one to Correctly interpret the Word. Paul states we are to study the word so we can “rightly dividing the word of truth.” The word “divide” literally means “cut it straight.” If one doesn’t study the Word, doesn’t educate themselves as to what it says, how can one “cut it straight,” handle it aright or handle it accurately? Of necessity, correctly handling the Bible, the Word of truth, will involve much study, contemplation, and prayer, as one can’t “rightly divide” the truth or interpret it correctly if one doesn’t study it or educate themselves as to what the text says. So in summary, one is not to leave their “education” and preparation at home when preaching or fail to prayerfully study the Word in preparation to preach, but one is expected through diligent study to fill their heart and mind with the Word and avail themselves of tools and resources to greater enhance one’s understanding of the Word. And then as a yielded vessel to the Holy Spirit, allow to flow forth the message the Lord as prepared for His people to hear.